In my continuing series of the backyard landscape makeover, I've arrived to the point where things are almost done (you know how that goes in gardening). This panoramic shot shows the backyard from way back. (Click on the photo to see it enlarged. My first attempt to upload larger photos failed. Sigh.) You can see the nicely sculpted lawn behind the rock wall on the right (the original lawn there used to be more angular). The bluestone patio is up against the house. The bluestone also wraps around the covered deck and is part of a large walkway along the carport. The four square boxes sit in front of the deck and the new fence can be seen to the left, along with one of my bird feeders. The photo below shows the stairs I talked about in a previous post. The bottom step allows for drainage to go to the right. The other steps are gravel with wood sides. I like how natural it looks and also the fact that I now have an easier way to get up there! This last photo has a closer view of the fence, which I love, especially because I don't have to look at what was there before! I had to talk my trusty carpenters into building it for me (they normally build interior cabinets, not fences, decks, or outside stairs like they did for me here). In front of the fence is an old Egyptian gate and in front of that is a new-ish bed containing clematis (my first try at it), daylilies, hosta, and a few other things. It's also in direct line of sight from the gravel path that goes between the boxes and down from or up to the deck. My only issue with the fence is that I did not have them finish it. 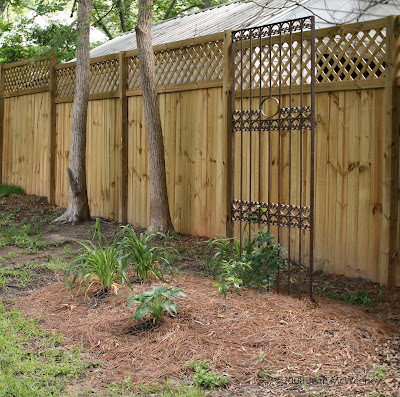 I.e., it doesn't wrap completely around the whole backyard and there's still a gate to put in on one side. And now my carpenters have other full time jobs. Good for them but not so much for me! I'm thinking in my next post I'll show you a few other beds we also built and talk about the plans for the rest of the backyard. And maybe at some point I'll show you the front yard and how we exposed the front of the house. But it's still very much a work in progress. It's very impressive and so attractive! I need to go back and read about your raised beds but they look like they are filled with some goodies. Hello, Jean! Thanks for leaving a comment on my post about changing my blog look. I didn't like the wasted space on the sides of my blog and chose the Blogger "denim stretch" template to get rid of them. Hope this helps. Now I'll take a look around your Louisiana garden. My b-i-l lives in New Orleans and I have lots of family in the Bastrop and W. Monroe areas. Hi Jean, it is fabulous. I love the wood and gravel stairs especially and your carpenters have made a most beautiful fence too. The whole thing is wonderful! Thanks Gail, Dee, Robin and Frances. Coming from you all that means a lot! Robin - thanks for the info. I tried another "stretch" template and that was indeed the trick. Now I can post larger photos (but I'm not going back to redo the others, that's for sure!). Also, I'm very familiar with West Monroe and Bastrop. Let me know if any of them have gardening blogs! Wow! Fabulous! I'm really enjoying dropping in on your garden from time to time - it's so different from my own, naturally. I'm just getting to this post now...a bit later in the season, but wow, it's lovely. Everything really took shape and it's fantastic! The fence turned out great. The whole area, including raised beds, was a great idea! I'm MUCH later getting here than the others, but I'm with them in admiring what you accomplished. I'm so glad you shared this series for the GGW Design Workshop, Jean: it's a great overview of the ups and downs of a big renovation project. The end result was worth every minute and every penny, though. 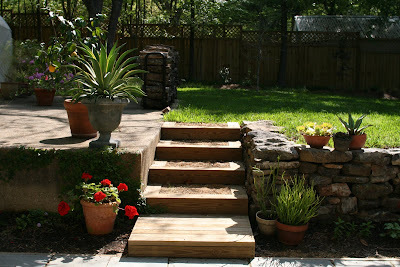 I think the wood stairs are terrific - and the fence creates a beautiful backdrop for it all. You can tell that a real gardener lives in your home! Great story, including the tear-your-hair-out moments. What is it with contractors that they take out all the wrong plants?